Evolve will be released for the PC, PS4 and Xbox One worldwide on October 21. Turtle Rock's Evolve is shaping up to be one of the sleeper hits of 2014, and now, it has an official release date. Mark October 21 on your calender, because that's when the hunt-or-be-hunted 4 vs. 1 multiplayer shooter will hit PCs, PS4s and Xbox Ones worldwide. Of course, it wouldn't be a big name triple A release in this day and age without a plethora of retailer-exclusive pre-order bonuses, and Evolve certainly doesn't disappoint on that front. Consumers who pre-orders the game from participating retailers will receive the Monster Expansion Pack, which includes the Savage Goliath skin at launch, and a new monster character post-launch. Select retailers will also be offering the Exterminator Weapon Skin Pack or Instant Hunter Pack as pre-order bonuses. While Evolve's developer Turtle Rock Studios is probably best known for the Left 4 Dead franchise, it cut its teeth working on a little game called Conter-Strike: Source. 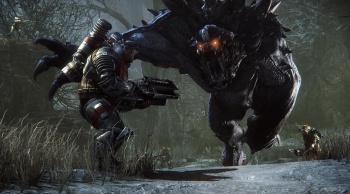 Evolve will launch with multiple monsters, hunters, game modes, and more than a dozen maps. For more info on the game, be sure to check out our own Greg Tito's hands-on impressions.